WD (s WDC) may be the next company to jump on the Google (s GOOG) TV bandwagon: The company started to look for a software architect for “Android based IP set top boxes” late last year, and the job offer suggests that WD may be looking to replace its existing line-up of streaming boxes with Android-based products. A WD spokesperson declined to comment when contacted for this story. 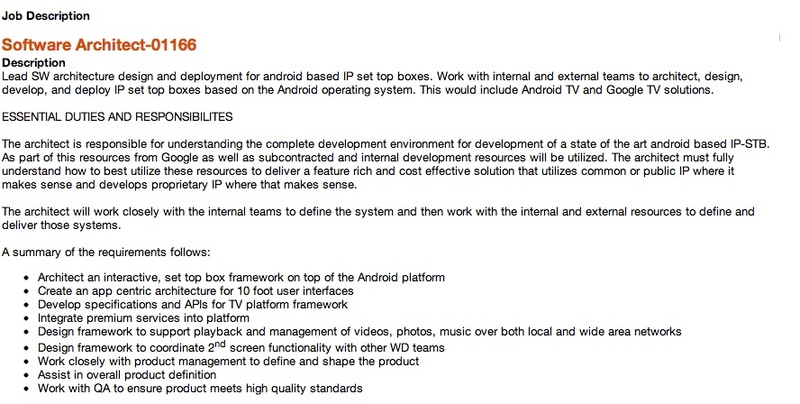 The job offer in question: WD is looking for a Google TV software architect. Google has signed on a number of new partners supporting the Google TV platform in recent months. At CES, companies showing off Google TV products included Netgear, (S NTGR) Haier, Hisense, TCL, LG, Sony, (S SNE) Vizio and Asus. And just last week, some 20 partners came together in Seoul for a closed-door meeting to plot the future of Google TV. WD has been in the market for streaming boxes for a couple of years. It currently sells three different products to bring online video services to the TV: The WD TV Live combines streaming services like Netflix (s NFLX) and Hulu Plus with support for local files. The WD TV Live Hub adds an internal 1 TB hard drive to the mix, and the newly-introduced WD TV Play offers a simpler UI and a clearer focus on online services. The WD TV Live Hub was first introduced in late 2010, followed by the WD TV Live in late 2011. Both could be up for a refresh this year, based on the typical release cycles for these kinds of devices. Really cool! I love that you got the info through a job post. They may just be dabbling in GTV rather than a full development push, but still it is a really interesting angle for WD to go in. It’s improper to call them streaming boxes when they are mostly media players.